This article contains a list of steps you can follow to create a Single-Issue Android app. Single-Issue apps are unique, "one-off" apps that contain a single mag+ Issue and cannot deliver new content. 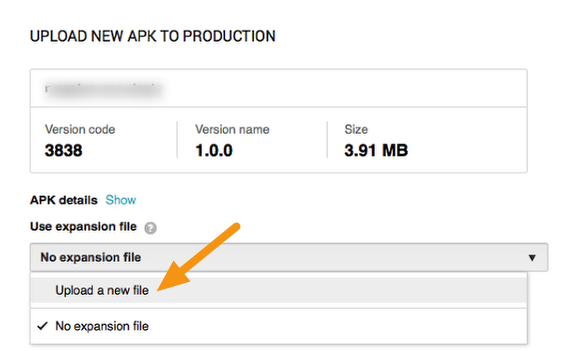 Single-Issue Android apps distributed through Google Play are created differently than typical Android/Kindle Fire apps because they must use Google Play's APK Expansion File feature for attaching content. 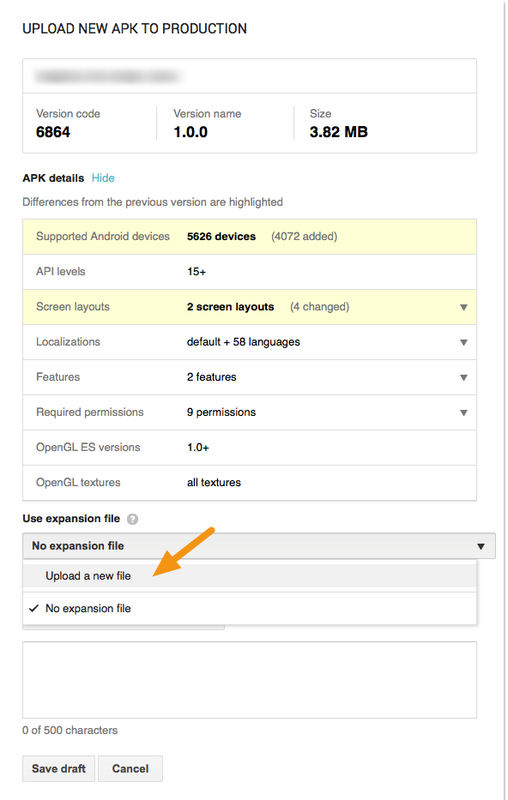 To learn more about Google Play's APK Expansion files, read the Android developer documentation entitled "APK Expansion Files." Due to the structure of APK Expansion Files, a Single-Issue Android app cannot contain only one Mag+ Issue to serve to both smartphones and tablets. For an app that will serve both, two Mag+ Issue layouts (called MIBs) must be generated and uploaded separately to Google Play. The steps below will walk you through the process. 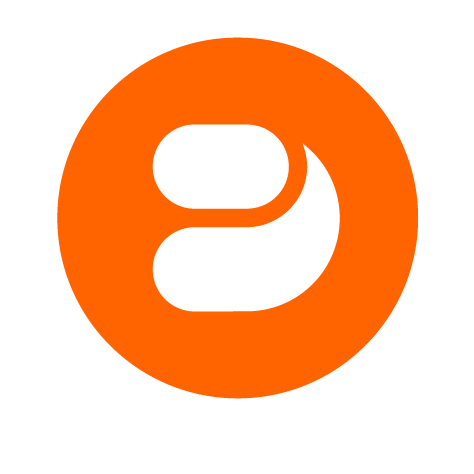 To build typical Android/Kindle Fire apps that can feature continuously updated paid and free content, along with integrations with subscriptions, read the article "Android/Kindle Fire - Building an App Step-by-Step." In order to create an Android app, you must have a valid mag+ Publish account. You also must have filled out the appropriate information under the Admin tab associated with your brand (see screenshot above). You will also need a valid account for Google Play that you have set-up previously in order to fill out all fields required by the mag+ Publish portal. You also need a mag+ Issue Bundle (MIB) file that has been created using the mag+ Production Tool. For more information, refer to the articles in the section "Assembling Your Issue." For detailed information on creating an Android/Kindle Fire distribution channel, refer to the section "Setting Up Distribution Channels." 1. 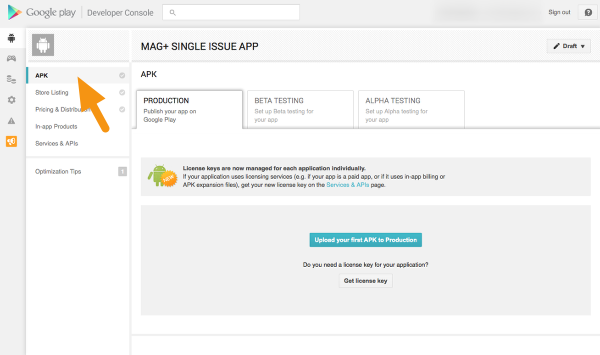 Begin by building a typical Android app in the Mag+ Publish portal. For instructions on how to do this, read the article "Android/Kindle Fire - Building an App Step-by-Step." When following the instructions at the link above, be sure to select the specific type of device you are targeting — smartphone or tablet — you cannot use the "Universal" option for Android Single-Issue apps delivered through Google Play. 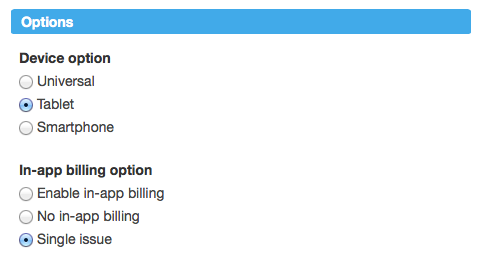 When following the instructions at the link above, disregard the information about the "In-app Billing Option." Under Android > Build Settings, you must set "In-app Billing Option" to "Single Issue." 2. Login to the Android Developer Console using your Google Account <https://play.google.com/apps/publish/‎>. 3. In "All Applications" click on your app. Note: When building a Single Issue app, you should have already created an empty app when setting up your Android distribution channel. For more information on creating an Android distribution channel, refer to the section "Setting Up Distribution Channels." 4. Click on the label "APK" on the left-hand side of the screen. 5. 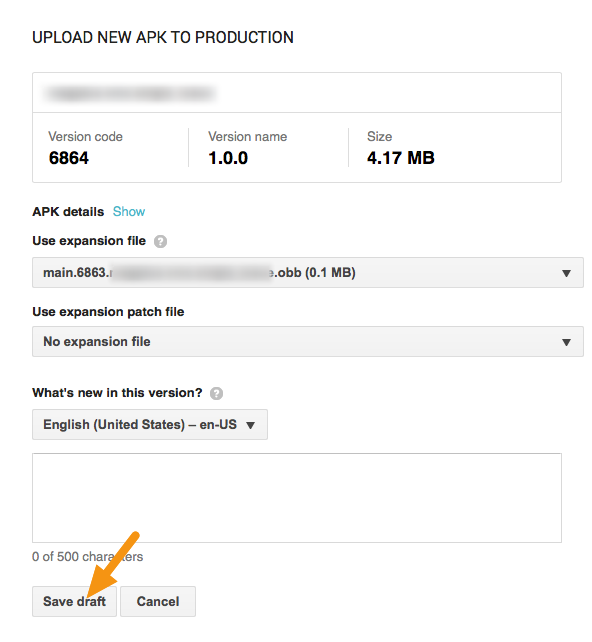 Click on the button "Upload new APK to Production." 6. 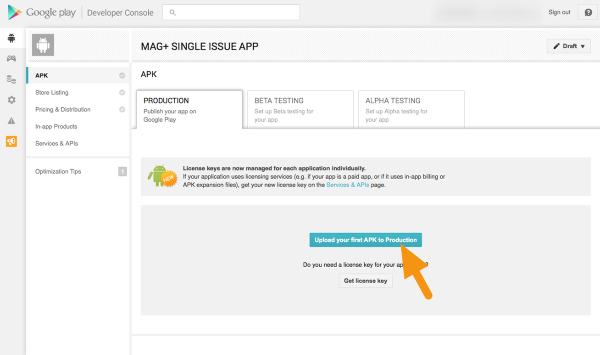 In the window that appears, upload the .apk file generated by the Mag+ Publish portal in Step 1. 7. Once the upload is complete, go to the "Use expansion file" pull-down and select "Upload a new file." Read the article Managing Issues for Single-Issue Android Apps. 8. In the dialog that appears, select the MIB you exported from the Mag+ Production Tool which will be embedded in your app. 9. Test your Single-Issue Android app on an Android device. 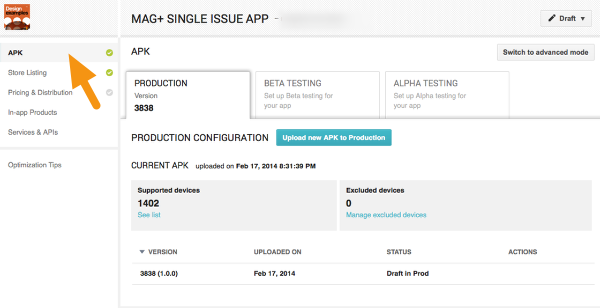 Note: For more information, refer to the article "Android - Single Issue Only: Testing Your App Before Distribution." 10. Submit your Single-Issue Android app to Google Play. When building a Google Play Single-Issue Android app that will serve content to both smartphones and tablets, you will create two builds in the Mag+ Publish portal (one for smartphones and another for tablets) and also two Mag+ MIBs (one designed for smartphones and another designed for tablets). 1. Build an Android app targeted for Smartphones in the Mag+ Publish portal and download it to your machine. When following the instructions at the link above, be sure to select "Smartphone" as the device option. When following the instructions at the link above, you must set the "In-app Billing Option" to "Single Issue." 2. Now build an Android app targeted for Tablets in the Mag+ Publish portal and download it to your machine. When following the instructions at the link above, be sure to select "Tablet" as the device option. 3. 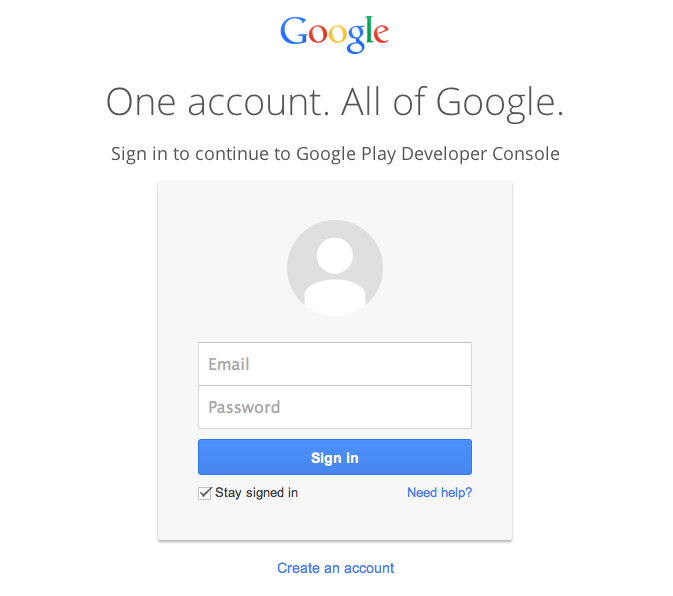 Login to the Android Developer Console using your Google Account <https://play.google.com/apps/publish/‎>. 4. In "All Applications" click on your app. 5. Click on the label "APK" on the left-hand side of the screen. 6. Click on the "Upload Your First APK" button. 7. Click "Browse Files" in the window that appears and select the Smartphone APK you downloaded from the Mag+ Publish portal. Note: It is required that you upload the APKs in the order you created them in the Mag+ Publish portal. 8. Once the upload is complete, go to the "Use expansion file" pull-down and select "Upload a new file." 9. In the dialog that appears, select the Smartphone MIB you exported from the Mag+ Production Tool, and then click on "Save Draft". 10. The smartphone version of your app should now be successfully uploaded. 11. 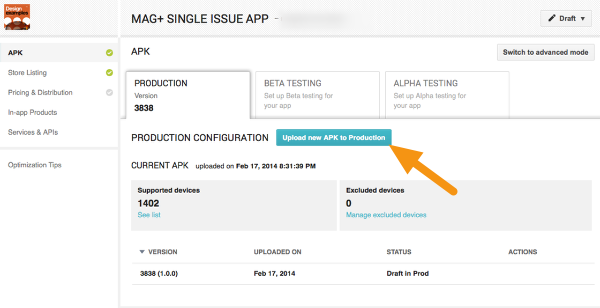 Now click on the "Upload New APK to Production" button to begin uploading the tablet version. 12. Click "Browse Files" in the window that appears and select the Tablet APK you downloaded from the Mag+ Publish portal. 13. 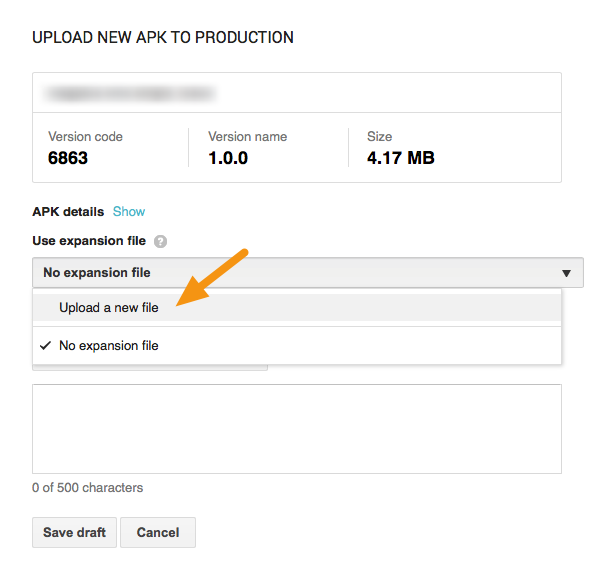 Once the upload is complete, go to the "Use expansion file" pull-down and select "Upload a new file." 14. In the dialog that appears, select the Tablet MIB you exported from the Mag+ Production Tool, and then click on "Save Draft". 15. The tablet version of your app should now be successfully uploaded. 16. Test your Single-Issue Android app on an Android device. For more information, refer to the article "Android - Single Issue Only: Testing Your App Before Distribution." 17. Submit your Single-Issue Android app to Google Play.